I must admit I am fascinated by this story. 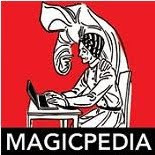 The event takes place September 20th 1905 and is a challenge between Houdini and someone who is referred to in newspaper articles as 'his erstwhile pupil, Jacques Boudini, or as the paper printed his name Bondini. The newspaper, The New York Times. reports, "When recently Houdini returned to this country, he found, Bondini, his erstwhile pupil, was usurping his field here." So basically, Houdini challenged this guy name Jacques Boudini to an underwater escape challenge. 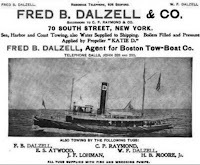 They were on the Fred B. Dalzell tug boat, along with a group of reporters. Both had handcuffs and leg irons placed on and were tied with a rope around the waist and lowered into the water below. They both went under at the same time and then, silence. At least for one minute and a half when Houdini's head bobbed above the surface of the water. He asked, "Is Bondini Up Yet? ", and the crowd replied NO! Houdini showed he was free from the cuffs and went back underwater. A minute later, Bondini came out of the water and reports say he didn't look well. He was still shackled as before. Then, he drifted back in the water. Houdini, came back up and again asked, "Is Bondini Up Yet?" again the crowd replied no. Then Houdini went back down for a third time but this time showed his ankles were free as well, as he went back into the water. 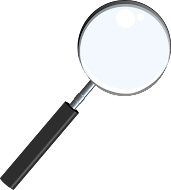 I wonder, if he was looking for Bondini? There was no reason to go back under at this point. A minute later Houdini emerged and asked to be pulled up by the rope. Then the men grabbed the other rope and pulled out of the water a lifeless Bondini. He was rolled around (that sounds very medically sound) and he did come to. But he was still stuck in all the cuffs and ankle restraints. Houdini was clear winner of the contest. Who was this guy? Erstwhile pupil? There are theories. Probably, two of the most current are from Pat Culliton who thought at one time Boudini might have been Jacob Hyman. He has since changed his thought on this and thinks it might be Leonard Hicks. It's possible, but I'm struggling with this theory only because when Hicks left performing, he was done. Yet. 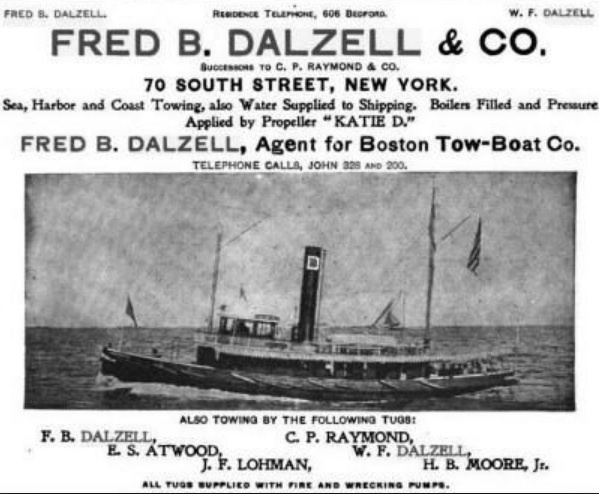 Boudini, shows up in 1912, and later. Still, the theory is plausible. Let examine this theory further. 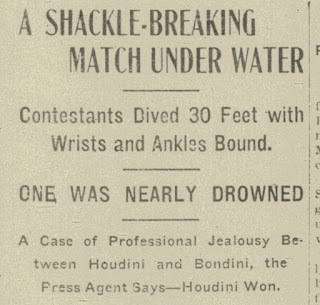 The original showdown with Houdini and Boudini takes place in 1905. Hicks meets Houdini in 1906 in Chicago and is invited to be his protege. a year after the apparent Boudini/Bordini event. However, the meeting in Chicago was actually the second time they met. Originally the two met in Richmond VA years before. Then in 1907 Houdini and Boudini both appear in Boston, at different venues but at the same time (see image left). 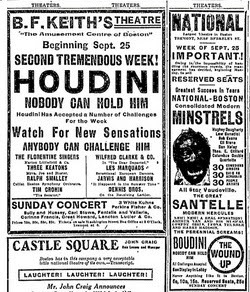 In fact, Houdini's billing says "HOUDINI -NOBODY CAN HOLD HIM"and if you look to the lower left of the image you'll see it says "BOUDINI NOBODY CAN HOLD HIM." And this would be about the time Houdini would be training Hicks. But the one surviving photo of Boudini and Houdini doesn't really look like Hicks. However, it's such a poor copy of the photo, it's hard to tell who it is. It could very well be Hicks. I'm pretty certain it is not Hyman though. Dec 1912 The Sphinx reports on page 349, that a team who went by Boudini and Stone were performing at the New Theatre, and presented magic and escapes. This was Washington D.C.. I found a second report of Boudini & Stone from a later date, also doing escapes and magic, but now I can't track it down. I want to say it was the 1930s after Houdini had died. It's possible that it's just another person named Boudini and NOT the one who was involved in the 1905 challenge. But if this is the same Boudini that Houdini challenged then he is not Leonard Hicks. The reason I say that is due to the fact that Hicks was a hotel owner in 1912 and quite involved in that business at that point. So then, Boudini, if not Hicks, would likely be someone from the east coast, because he only appears in NYC, Boston and Washington DC. Maybe Oudini, the guy from Boston who wrote the booklet on escapes and was working the area in 1900? One thing puzzles me, ok a bunch of things do, but the newspaper article says, "When recently Houdini returned to this country, he found, Bondini, his erstwhile pupil, was usurping his field here." There is a problem with this statement. There is NO record of a Bondini, or Bourdini, or any B-ini that I can find prior to 1905. NO newspaper reports, nothing. He surely wasn't 'usurping Houdini's field' then. Many folks were led to believe, including some reporters that this whole thing was a stunt created by Houdini to showcase Houdini. That could be and probably was the case. Going back to the original theory, it could have played out like this. Houdini meets Hicks in Richmond and is aware of his interest in escapes. A few years later, Houdini invites the young Hicks to help him in a stunt in 1905, a one time deal. 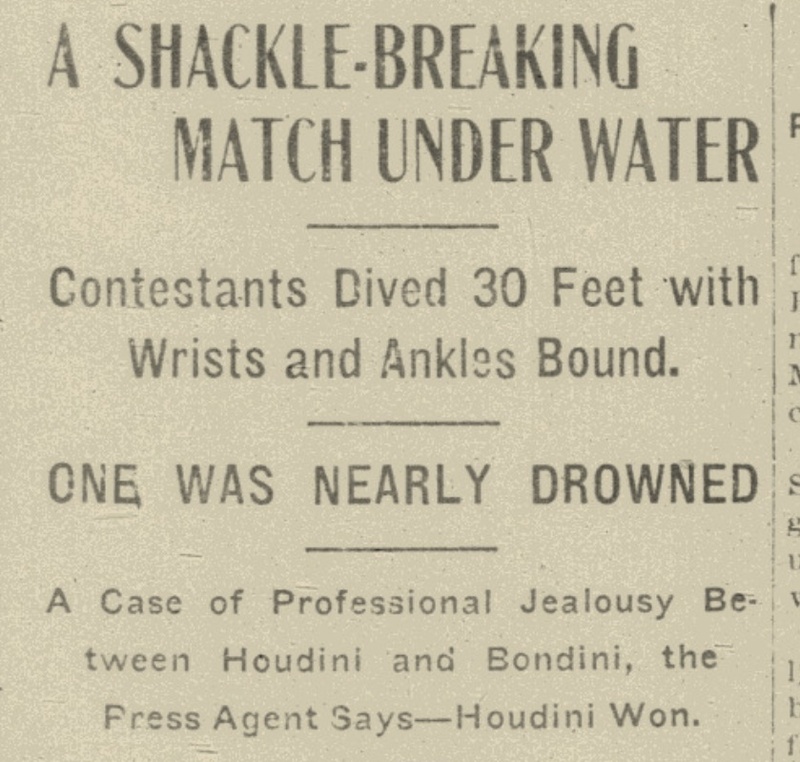 You'll notice by the report that Houdini keeps popping his head above water asking about Boudini. I think this has less to do with the challenge and more to do with the fact he is concerned for this person's safety. In the end, Boudini survives and goes back to Chicago to work at the Saratoga Hotel that his father owned. Then Houdini comes to Chicago in 1906, stays at the Saratoga Hotel, invites Hicks to his show, the two get to talk, Houdini is grateful for Hick's help in 1905 and offers him the spot to be protege. Why? Because Houdini is heading to Europe in the later part of 1908 and having 'Houdini presents The Great Leonard' keeps his name in the press. Of course, Hicks can't use the Bordini/Boudini name, which is why he goes by Harry Leonard. And the rest is history. The later Boudini and Stone is then not the original, just a coincidence. THAT is one possibility. A clear photo of Boudini might help a lot more figure out his identity but I've scoured a ton of newspapers from that time and have come up with nothing. Who do you think this Boudini guy was???? Any thoughts? Please leave them in the comments below. Perhaps someone out there has a photo that we don't know about. Maybe together we can figure out this mystery once and for all. To read a bit more about the Houdini Boudini Challenge, go here.